With the nature of work changing, companies are reforming how offices are set up and how their staff work, in an effort to get better outcomes for everyone. Alex Braae checked out two of New Zealand’s biggest companies to find out more. Looking back on predictions of the future is always an interesting experience, especially when the predictions turn out completely wrong. One that anyone who’s ever been trapped at rush hour on the Auckland motorway might pause and ponder – once upon a time it was assumed that a huge proportion of the workforce would be working from home by now, and only occasionally heading into the office. Alas, that clearly hasn’t come to pass, as lines of commuters backed up on the on-ramps every morning shows. But in many other aspects, office work is changing dramatically. A lot of that is being driven by employers, who are looking to find new ways to make their workforce more efficient, as well as giving their staff a more satisfying work experience. To do that, they’re having to reimagine everything about the office environment. Fonterra might at first glance seem like an unlikely company to be leading the way here. They’re fundamentally a primary industries company, a farmer-owned cooperative that produces massive quantities of dairy. But much of their workforce wears collars as white as cow’s milk. Around 1500 of them are based at the spacious, modern building on Fanshawe Street, on the fringe of the Auckland CBD. The building itself is wholly occupied by Fonterra, and was designed to evoke the more earthy parts of their business. Staircase walls have the deliberate look of fence posts covering rolling hills, the carpet pattern reflects what farmland looks like from the air. The rules of the building are even designed to be like a dairy processing plant – when visitors are guided around, they’re reminded to maintain three points of contact at all times when going up and down the stairs. But as for the way staff actually work, it almost couldn’t be more different to dairy farmers tied to their own patch of earth. 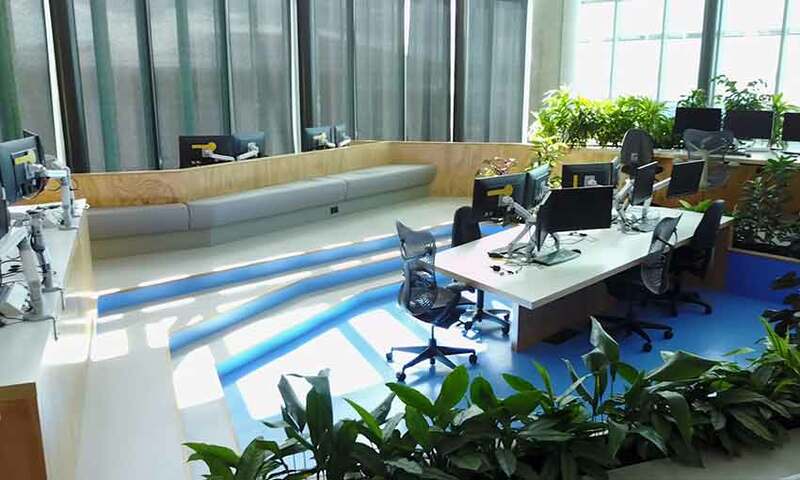 Fonterra’s office uses an extreme form of hot-desking: there are no computers at all, just screens to be plugged into. It’s entirely open plan, and even managers don’t get enclosed offices. For meetings or smaller, more private conversations there are a range of alternative spaces, from booths and couches to meeting rooms with actual doors. There’s also a lot of cafes scattered around the building, with subsidised coffee for staff. It is using the company’s product after all. What does this environment achieve? 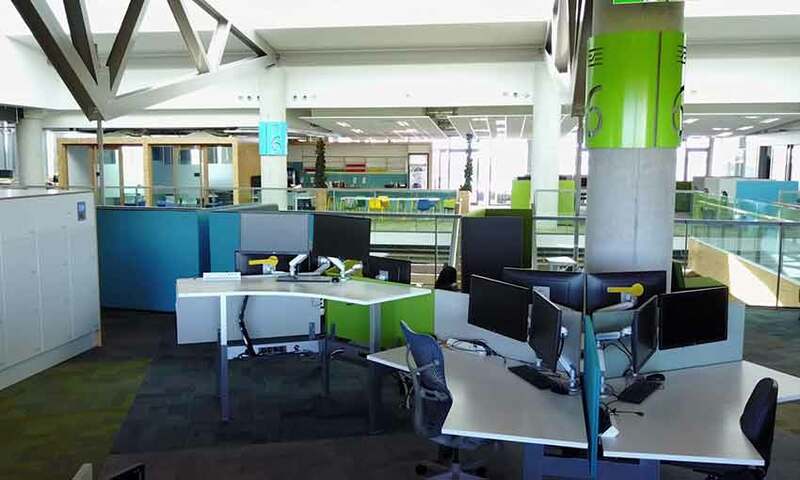 Fonterra’s acting MD of people and culture Mark van Zon says it’s about creating a workplace that is more efficient, engaging and collaborative. Fonterra have also recently brought in a new way of dividing up staff time, allowing them to spend up to 30% of their hours each week working on projects outside their core roles. 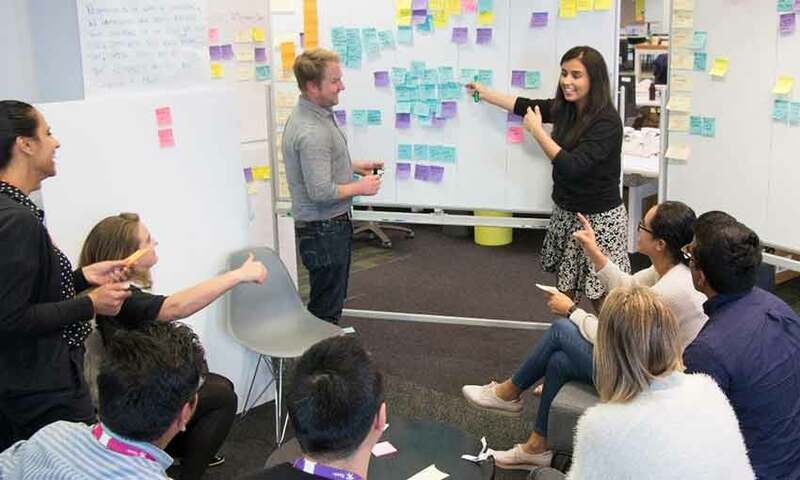 Jacky McManus, head of HR at Unitec, says larger companies often struggle to reinvent their structures and workspaces to be better for their employees. “For smaller companies, it’s sometimes a bit easier, because you’ve got a few people and the communication is easy. You don’t have the restrictions and structures and policies that bigger companies have to have.” She says policies and procedures can tie up big organisations, but increased productivity can come from understanding what employees want, and delivering that to them. 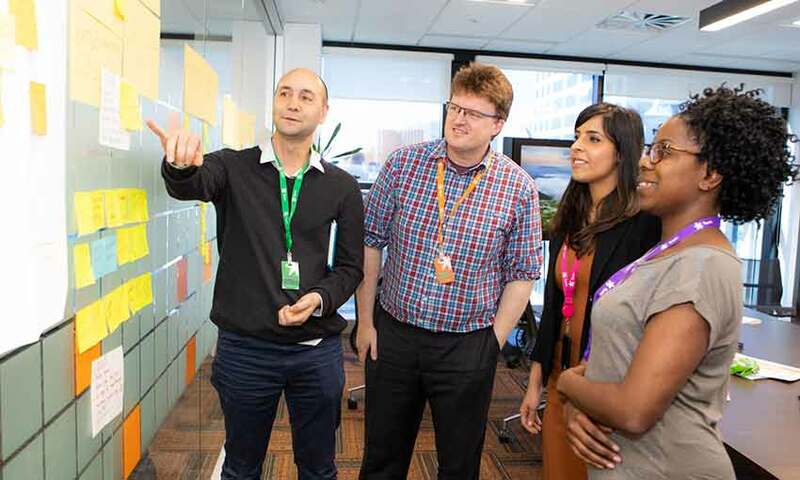 Getting more valuable contributions from employees is part of the philosophy up the road from Fonterra at Spark. The telco controversially instituted a new workplace system known as Agile. The controversy came after reports that staff would basically have to sign up to new Agile-focused contracts, or they’d be out the door. 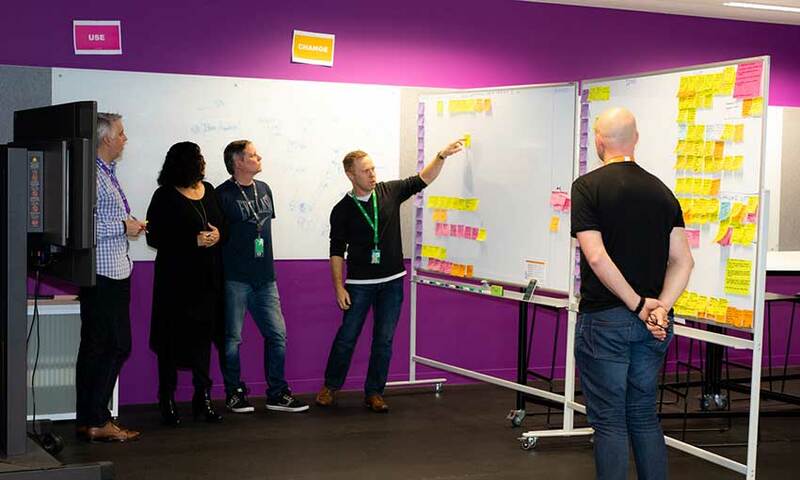 Spark’s GM of Agile Implementation Lindsay Cowley says it’s fair to say not everyone welcomes big programmes of change, but notes that the uptake of the new contracts was 98% – almost the entire workforce, and more than his team was expecting. He admits it wasn’t an easy process, but insists that now it is in place, almost nobody wants to go back. Agile has an initially bewildering array of terminology to get your head around, like tribes, scrums, chapters, squads, sprints and missions. At a basic level, groups containing around 10 people with different skills (or from different chapters) make up the squads, who each have a mission. That mission feeds into the overriding goals of their tribe (sort of like a business unit) of around a maximum of 150 people. But there’s a different concept of hierarchy to the traditional pyramid-like structures of large organisations. The key to getting that change over the line was “being Agile to go Agile,” says Lindsay Cowley. “What normally happens with big corporate change programmes is that it tends to involve putting a bunch of people away in a darkened room; nobody talks about the fact that they’re in there even though everyone knows they’re in there. And then about a year later they come out with a big reveal of something that isn’t really that applicable to the world you’re in anymore.” He says the key difference with Spark was constant, two-way communication – both to reassure staff that they weren’t about to get trampled, and also to initiate them in the new ways of working. In this sense, leading a big organisation is a bit like steering a giant container ship. If changes are going to be made, a lot of moving parts have to be working together so that turns can be made safely, without crates falling into the sea. As major New Zealand companies make their changes, their progress will be watched by other organisations, eager to pick up ways to avoid becoming shipwrecked. Unitec offers a friendly and diverse learning environment with flexible study programmes, lots of support, and hands-on experience to build the skills you need for your future. So if you want a career – professional, vocational or trade – then visit unitec.ac.nz and apply today. Originally posted by The Spinoff on November 15, 2018.